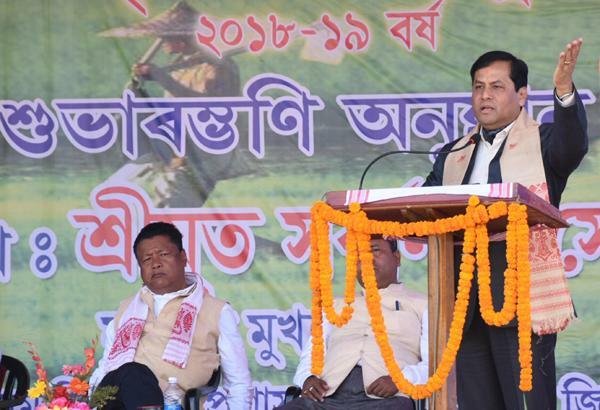 Assam Chief Minister Sarbananda Sonowal Monday said that the state government is taking all steps to ensure the socio-economic wellbeing of farmers. Policies are being implemented to uplift the poor farmers and labourers so that all sections of the population can derive equal benefit from the development agenda of the government, he said inaugurating the Mukhyamantrir Krishi Sa-Sajuli Yojna scheme at Dhemaji. "Farmers are the backbone of Assams economy and therefore various steps are being taken to empower them," he said. Sonowal distributed approval letters of Rs 5,000 each to ten farmers of Dhemaji district under the chief minister's farmers welfare scheme. Under it 13,800 farmers of the district would receive Rs 5000 each through direct bank transfer to purchase farming equipment to increase their agricultural production. Sonowal said that agricultural produce of Assam have reached the markets in London, Dubai and Singapore among other cities through air cargo service, which was launched recently and urged farmers to advantage of it to sell their products outside the state. He referred to the exposure trip of farmers from the state to Vietnam and asked cultivators to emulate the example of that country for rapid economic development through agriculture. Referring to the Jan Dhan Yojana launched by Prime Minister Narendra Modi, the chief minister said at least 1.5 crore of the state have benefitted by the financial inclusion scheme. Fasal Bima Yojna, Soil Health Card, Krishi Sinchai Yojna, fixing of minimum support prices (MSPs) for crops, extending Rs 6000 to farmers under PM-Kisan scheme in the 2019 union budget are some of the important steps by the central government, he said. Earlier no development used to happen in the state without people here resorting to agitation. Now a plethora of activities have taken place like approval of five new bridges over Brahmaputra, double tracking of railway lines, inauguration of projects worth Rs 18000 crore by the prime minister, including the construction of AIIMS at Changsari near Guawahti," he said. Sonowal asked youngsters to empower themselves through knowledge and skills.